Definition at line 711 of file Comment.h. Definition at line 717 of file Comment.h. Definition at line 737 of file Comment.h. Definition at line 722 of file Comment.h. Definition at line 733 of file Comment.h. Definition at line 745 of file Comment.h. 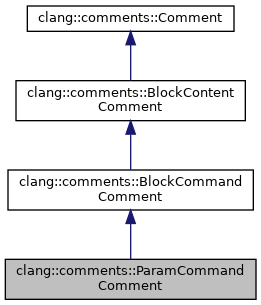 Definition at line 177 of file Comment.cpp. References In, InOut, and Out. Referenced by clang::comments::Sema::actOnParamCommandDirectionArg(), and clang::TextNodeDumper::visitParamCommandComment(). Definition at line 785 of file Comment.h. Definition at line 356 of file Comment.cpp. Definition at line 764 of file Comment.h. Referenced by clang::comments::Sema::resolveParamCommandIndexes(), and clang::TextNodeDumper::visitParamCommandComment(). Definition at line 768 of file Comment.h. Definition at line 758 of file Comment.h. Definition at line 749 of file Comment.h. Referenced by clang::comments::Sema::actOnParamCommandParamNameArg(), and clang::TextNodeDumper::visitParamCommandComment(). Definition at line 772 of file Comment.h. Definition at line 776 of file Comment.h. Definition at line 753 of file Comment.h. Referenced by clang::comments::Sema::actOnParamCommandDirectionArg(), and clang::comments::Sema::actOnParamCommandParamNameArg(). Definition at line 780 of file Comment.h. Definition at line 791 of file Comment.h.